Warning: The videos contained in this post contain adult language and references. The explosion of interest all started on New Year’s day when two videos from VRChat went viral. The first video was a clip from Twitch.tv of a gamer named Kers55 playing VRChat and meeting a girl. He was surprised to discover that the girl was “a black girl irl” (i.e. 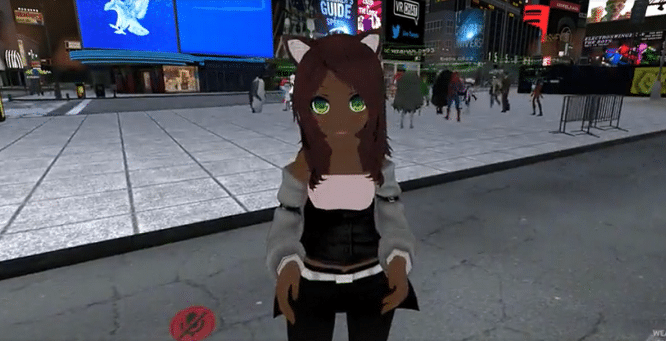 an African-American female in real life) and was excited because he too is black and said he meets mostly white people in VRChat. The two were interrupted by another player that was dressed like a Black Knight agreeing with them that there are too many White Knights in VRChat. Things got a little more weird when the same day a video titled “DO YOU KNOW THE WAY” was uploaded to YouTube by user Syrmor. The video shows a large group of players that resemble Knuckles from the Sonic the Hedgehog games running around VRChat asking other players if they know the way, spitting on them, and searching for other players to join them. The video shows a better look at VRChat than the previous video showing characters dressed as Hank Hill, Moe Szyslak, Goku, and Winnie the Poo among others. This group has became known as the “Ugandan Knuckles” tribe and the meme took hold spreading across the internet quickly. The original YouTube video currently has around 5.5 million views and uses a Carl Sagan quote as the description. To their credit the Ugandan Knuckles tribe is using the video’s popularity to raise money for projects in Uganda on the Global Giving website. Syrmor has made other videos showcasing VRChat for his quickly growing YouTube audience (at 22,000 subscribers currently) including one titled “VRChat was a mistake” which also uses Carl Sagan clips and audio. Other gamers and creators are getting in on the fun now. With all kinds of quirky and strange things. Gaming website Kotaku published an article title “VRChat Is Not The Cyberpunk Future We Dreamed Of“. A great article which points out the old-school internet feel of this new technology and the very real implications for the real world. Currently there are no rules in VRChat about copyright or trademark infringement. From character avatars of famous fictional characters that are completely unlicensed, to recreated Mario Kart race tracks, to completely accurate replicas of Chucke E Cheese and TGI Friday’s restaurants, VRChat is a wild, untamed, frontier. As one Redditor said “VRchat sure brings out the weird in people.” And when people, especially young adults, are allowed to be weird and anonymous we often see communities grow. In the late 1990’s many people started using the internet simply to discuss topics on message boards and forums or to use chat rooms under the umbrella of total anonymity. VRChat may very well be what the Virtual Reality industry needed for everyday users to justify the expensive VR gear and may signal that 2018 might see larger Virtual Reality adoption across various consumer segments. 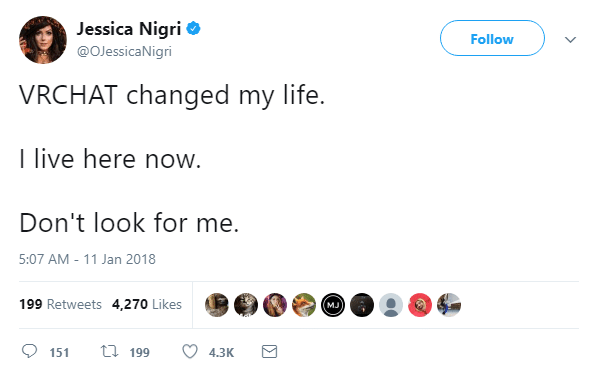 We’re already seeing some of that evidence in early responses to the viral success on Twitter.